State of the Cube – RTR Update Part 5: Green(e Daye) | Action Points! Oddly enough for the creature colour, Green doesn’t actually have the most creatures. What it lacks in number though, it makes up for in quality. Green has the highest creature size score of all the colours, and has the most number of medium to large creatures. Still, I would like to emphasise Green’s commitment to its creatures and I’ll probably tweak the creature balance in Green for the next update. Another interesting statistic is that Green is the least colour intensive of all the colours, which fits into its colour fixing role. 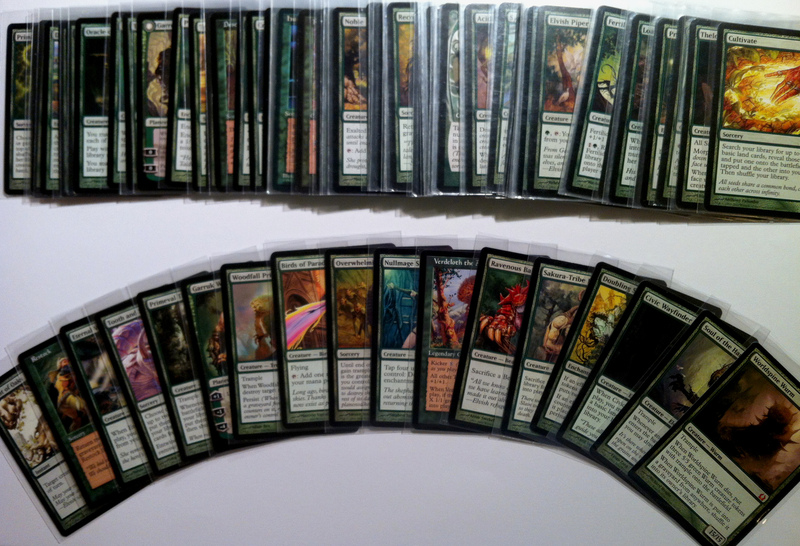 You want to be able to access your colour fixing as easily as possible in a multicolour deck, and having your Green fixers require lots of Green would work against that. Green loves mana and, by extension, lands. It is great at getting more of it and/or more colours of it. Green lets you search out land from your library, or lets you play more than one land a turn, or has plenty of non-land cards that just straight up make mana. It differs from Red and Black with their little smatterings of mana acceleration in that its mana acceleration is often permanent. It wants to improve your overall mana growth, rather than just provide a quick temporary boost. Additionally, it provides you with multiple ways to use your lands an mana, either with landfall triggers, effects that trigger off the number of lands you have, or just some mana sinks. Next to White, Green is also great at creating an army of creature tokens. After having played with this configuration for a while, I’m planning to differentiate the way the two colours make creature tokens by letting Green have more repeatable ways of creating tokens like through tapping a creature or paying mana. I’m also considering having more large creature token producers in Green. It Just Got EVEN BIGGER! Since Green is focused on creatures, it makes sense that one of its themes is making its creatures better. Most Green spells only pump the power and toughness, but also sometimes grant abilities like Trample, Reach and Regeneration. Also, since it is the other “army” colour, Green also has ways to pump all its creatures at once. Green also has many cards that interact with the +1/+1 counters used to grow its armies. As mentioned before, Green has ways to directly deal with every other permanent type than creatures, and it has the Fight mechanic that capitalises on its focus on creatures. Green also has some lifegain, some ways to return cards from the graveyard to hand, and tutoring for creatures. Green also gets card draw, which is usually tied to creatures somehow, and mass damage against flying creatures. My focus for the next update is to tweak the creature makeup for Green. 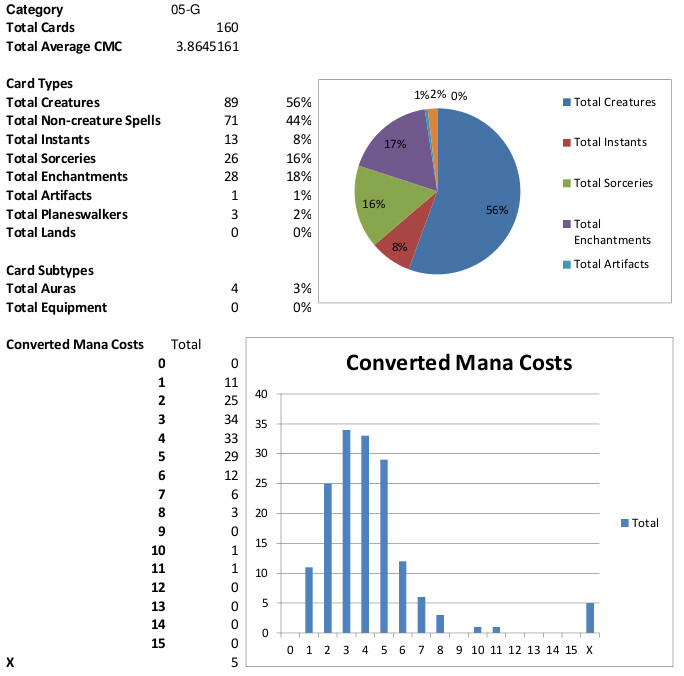 Looking at the statistics for creatures, I’m hoping to include more creatures that emulate spell effects and increase the creature count for Green while still keeping Green interesting. I’m also hoping to increase the theme of +1/+1 counters and the creature pumping abilities in Green. Right now, Green is still pretty powerful and I’m just hoping to reinforce Green’s focus on creatures while maintaining the power level.